In our nation, European football is far more popular in households than Indian football. It is very hard to hide the fact that Indian football is lagging behind in world football. That is due to various reasons. Such as lack of good grounds, training facilities, infrastructures, over powering sports like cricket etc. India has never played in a Football World Cup. Although India had qualified for the World Cup in 1950, it withdrew for various reasons! Will we ever see India play in the World Cup our lifetime? That’s a question nobody can answer. In a country where cricket is a religion and the national sport is thriving for survival, there’s hardly any scope for promotion of football on a national level. The big money spending corporates only wish to cash in on the already developed sports. However, we – at Parle Premier Sports League Pvt Ltd have been organizing a franchisee based football league every year for the past two years in the month of May in Mumbai. This is our small step towards a brighter future for the young footballers of Mumbai. We are providing an ideal platform for emerging stars to showcase their footballing skills and their passion and love for the game. And yes, it’s a very unique tournament and we proudly claim it to be one of its kind! It isn’t a “Get your own team, pay the entry fees and play the game” kind of a league. Eight Teams à Teams auction à Players registration à Scouting à Players auction -àThe Game! What more is astonishing about the league is the fact that all four organizers are youngsters out of which three are still graduating and yet, they’ve put their heart and soul in making the idea a huge success. The league started off as a small suburban event with the participation of over 80 players in its first season– mostly local. Although the event was carried out on a low scale, the concept was immediately a hit! The league drew a lot of expectations for the season II. A larger ground, with obviously a larger capacity for spectators to be entertained and around 120 participants – that’s how we started off living up to the hype of PPL! The two teams that were auctioned racked up total proceeds of almost half a lakh rupees! 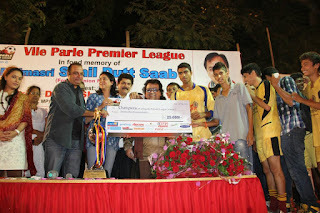 And with the likes of Bappi Lahiri, MLA Krishna Hegde, Priya Dutt and Pankaj Dheer attending the Grand Finale of PPL Season II, the sequel tournament turned out to be a blockbuster hit! Post season II, the league attracted numerous persons willing to own and manage a team in PPL. The six teams auctioned were grabbed for a total proceed of Rs. 4.5 lakhs. The participants this time are approximately 160! Bettering the season II is a challenge we’ve taken up on ourselves this time. 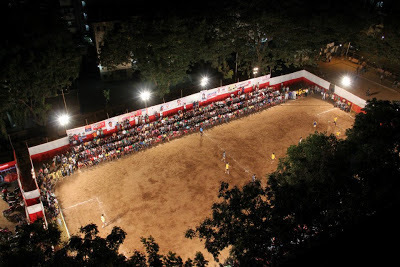 It is our aim to spread football all over aamchi Mumbai! The fireworks will be the loudest this season! Watch us better ourselves than last year. Parle Premier League (PPL) is all set to be played from May 17th to 25th in the evening at 5.30 to 9.00 under lights! Watch the tournament live at Dubhashi Maidaan in Vile Parle (East), Mumbai - Your Pit Stop for Football!